Carpooling - Fair and Easy. So, you are a group of people who share a ride to work, university, etc. You have a schedule, but it is dynamic, flexible, and sometimes even changes at the last minute. You want to know anytime a group member will join the next ride. 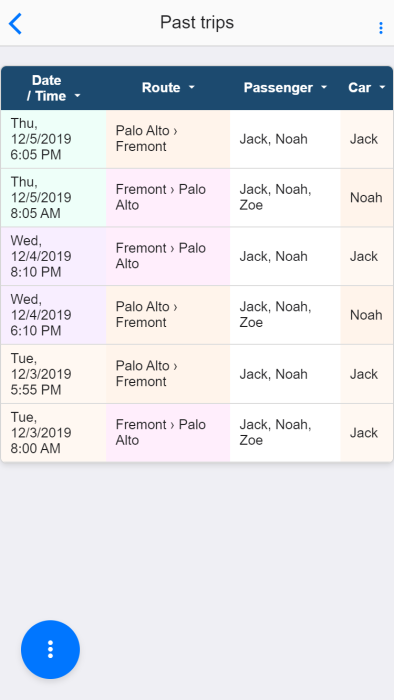 There are changes to the regular schedule, since Zoe is ill this week and you want to notify the others that you have to work overtime tonight and that you won't return home with them. Whose turn is it to drive tomorrow? Is his/her car big enough for all planned riders? Has the driver seen the planned ride together? 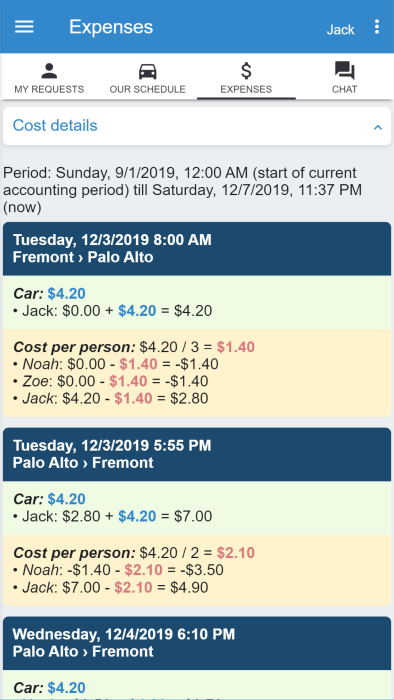 Most carpools aim at fair cost sharing for their joint rides based on best approximations of real costs, avoiding unfair economic benefits for the drivers. Factors such as fuel consumption, current fuel prices, tollways and discounts have to be taken into account. 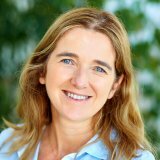 Here is a list of great and unique features of MyCarpoolApp. 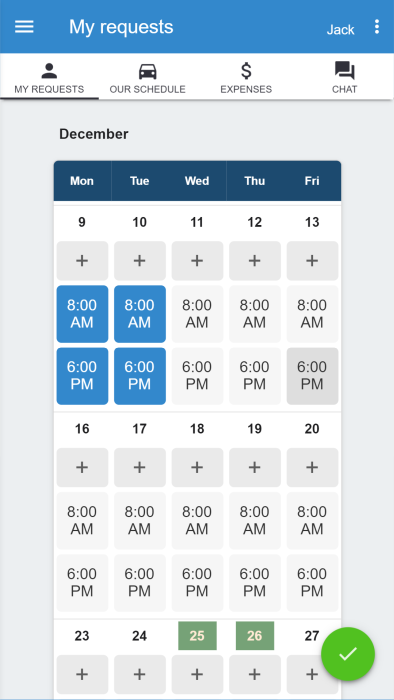 Every group member can select routes, days and times they want to carpool with only few clicks in a few seconds. Date, time, route, riders and drivers are displayed in an intuitive, clear list. You can modify the automatically suggested planning easily. Awareness of the driver about the next ride is confirmed. One of the best algorithms estimates shared costs for you. 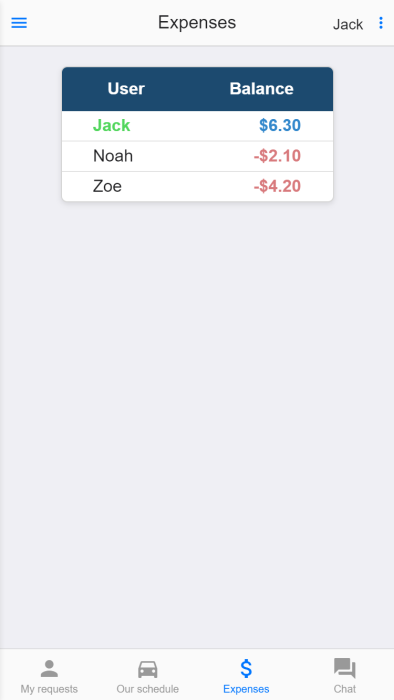 Manage your internal payments, visualize usage statistics and a detailed log of costs for every trip. This app is easy to use. Context-sensitive hints and interactive help guide even for inexperienced users. 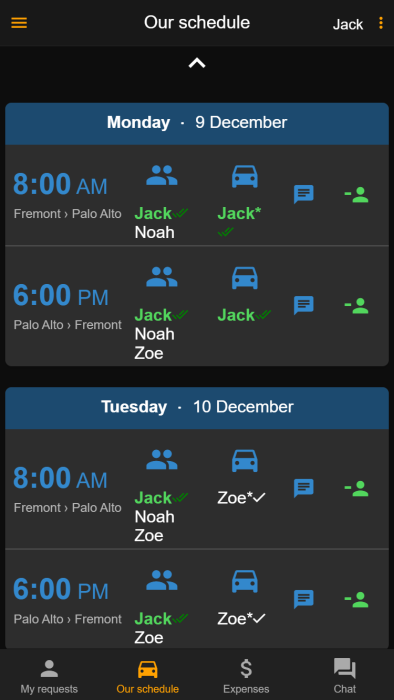 This version of MyCarpoolApp is free to use. You may use the integrated chat with your peers, be informed about last-minute changes thanks to notifications, personalize graphical design and multi-stops. Please read more features in the descriptions of the app stores or ... simply try MyCarpoolApp out! The client app on your smartphone, tablet or PC is only part of the story. 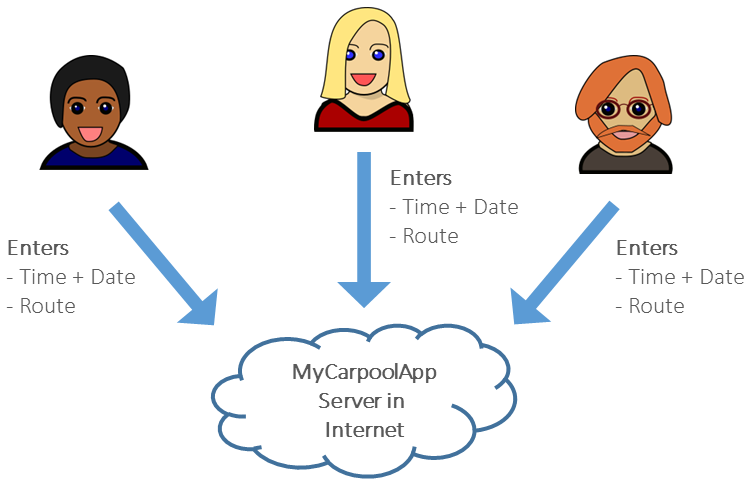 Moreover, there is a server on the Internet that stores and processes the data of your carpool. Therefore it is necessary that your device is online to use MyCarpoolApp. 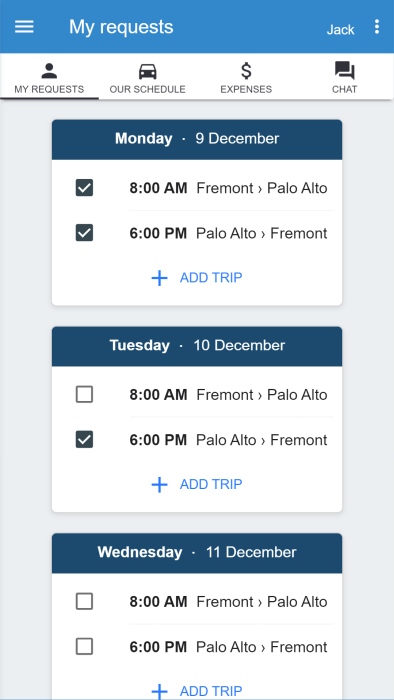 Every day or at least once per week, and of course every time there is an unexpected change in your schedule, every member of your carpool marks the checkboxes corresponding to the scheduled trips requesting when they want to ride and which route they want to take. This takes only a few seconds. 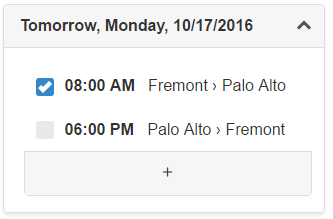 Moreover, adding unscheduled special trips is easy. You will be prompted to store your changes on the server. Check the planning. Confirm or modify it. 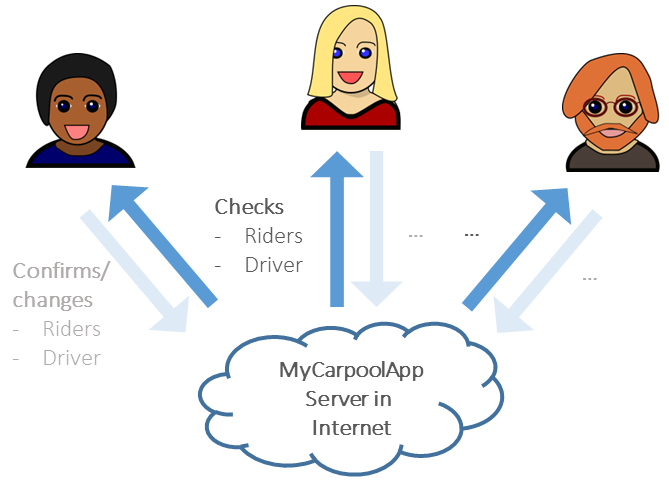 Before every joint ride, the drivers should access the latest planning from the server, which is based on the individual requests, and check for last-minute changes. You may select another driver and add or remove riders, if they asked you to do that on their behalf. Our carpool has been using this app since its first alpha version for more than four years and I find it very useful. I can hardly imagine carpooling without using it. Check out the look and feel of MyCarpoolApp. 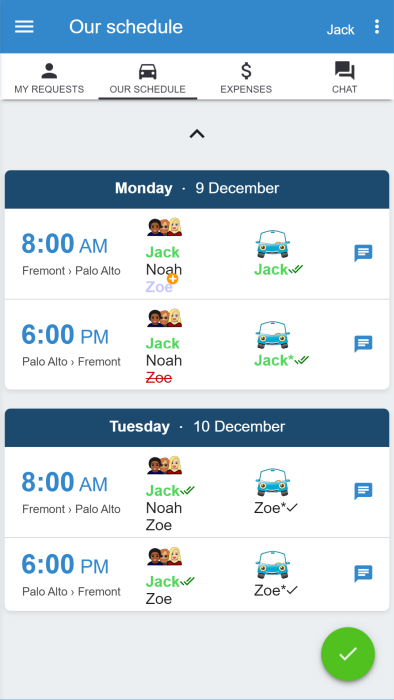 MyCarpoolApp will be available soon. If you want to take part in our beta test, please fill in the contact form below. Thank you! Copyright © 2016-2019 Michael Obach - All Rights Reserved.